These are brief demos just to help you get the hang of it. 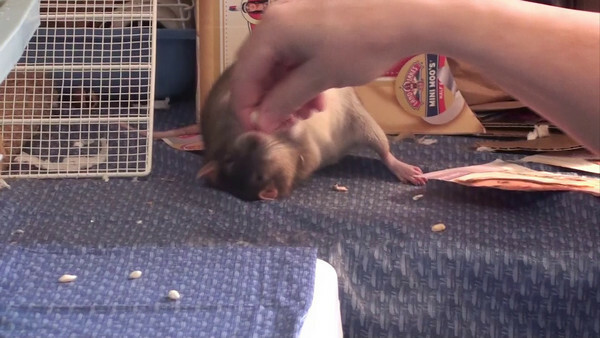 If your rat is wiggly and squirmy and doesn't like to sit still in your arms, you can ask her to learn to quiet, starting just on a table, under your hand. Rats feel protected under cover, and some even like to be in a snug snuggle. I'm not sure if this applies entirely but rats seem to be either extroverts (outgoing, not shy, less fearful) or introverts (more shy, hesitant). My introvert rats like this snug "grip" more than my extrovert rats. This video has 3 examples.